Nestle Infant Cereals are made of natural grains, fruits or vegetables, and use CHE (Cereals Hydrolysed Enzymatically) Technology that break down carbohydrates in cereals into smaller units, thus making them easier to digest. They also contain PREBIO® 1 to help maintain a good digestive system.CERELAC now brings Triple Goodness, the unique and delicious combination of yogurt, cereal and Bifidus BL that supports your baby's healthy growth in three ways. Open to parents with kids aged 6-12 months old. 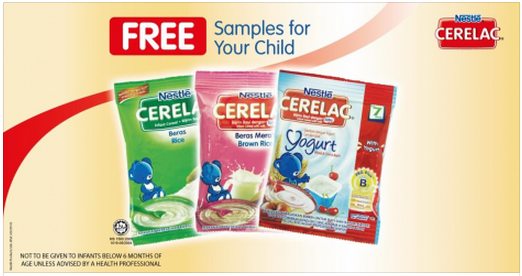 Nestlé CERELAC Infant Cereals sample redemption is limited to 5,000 requests only. Three (3) sachets of 25g Nestlé CERELAC Infant Cereals samples will be sent to registered mailing address. The variants depend on stock availability. Thanks but Cerelac is great way to fulfill your baby daily dietary and nutritive requirements. It has Iron, Calcium, Fatty Acids and Vitamins thats helps child in early stage development.